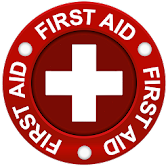 It is very important that all members know where to locate First Aid equipment in the event of an emergency at the Club. There is a portable First Aid Kit located in the main hall to the left of the main entrance heading out to the Beer Garden. This has been placed on a shelf underneath the storage cupboard for the defibrillator. There is also a small first aid kit located in the kitchen near the window.